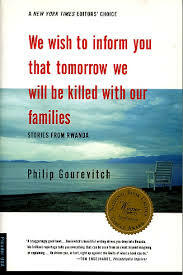 A couple of weeks ago I mentioned that I had been reading an excerpt from Gourevitch’s book with my Intro class (his first chapter is included in our reader). I was particularly struck by his comments about the awkwardness but also, in his view, the necessity of “looking closely into Rwanda’s stories.” His argument is that “ignoring them makes me even more uncomfortable about existence and my place in it”; when, reading Wave, I was worrying about the morbid voyeurism of contemplating other people’s tragedies, this line echoed in my head, as it implies that what we ought to feel uncomfortable about is looking away. I had never been among the dead before. What to do? Look? Yes, I wanted to see them, I suppose; I had come to see them — the dead had been left at Nyarubuye for memorial purposes — and there they were, so intimately exposed. I didn’t need to see them. I already knew, and believed, what had happened in Rwanda. Yet looking at the buildings and the bodies, and hearing the silence of the place, with the grand Italianate basilica standing there deserted, and beds of exquisite, decadent, death-fertilized flowers blooming over the corpses, it was still strangely unimaginable. I mean one still had to imagine it. “One still had to imagine it”: how can this be, if you already know and believe — if you’re looking right at the terrible evidence? It’s not so much that it happened that he can’t comprehend as how and why. (“How many hacks to dismember a person?” “What is required above all is that they want their victims dead. They have to want it so badly that they consider it a necessity.”) And yet even the remains of the dead (“the strange tranquility of their rude exposure”) are not really enough to make their bleak reality real to him: “I wondered whether I could really see what I was seeing while I saw it.” Disbelief and the inability to imagine: it’s against these forces that a book like Night, or a book like this one, is written. Looking up from the paper, I saw a group of museum staffers arriving for work. On their maroon blazers, several wore the lapel buttons that sold for a dollar each in the museum shop, inscribed with the slogans “Remember” and “Never again.” The museum was just a year old; at its inaugural ceremony, President Clinton had described it as an “investment in a secure future against whatever insanity lurks ahead.” Apparently all he meant was that the victims of future exterminations could now die knowing that a shrine already existed in Washington where their suffering might be commemorated, but at the time, his meaning seemed to carry a bolder promise. proved to be hollow, and for all the fine sentiments inspired by the memory of Auschwitz, the problem remains that denouncing evil is a far cry from doing good. revulsion, alarm, sorrow, grief, shame, incomprehension, sure, but nothing truly meaningful. I just looked, and I took photographs, because I wondered whether I could really see what I was seeing while I saw it, and I wanted also an excuse to look a bit more closely. Edmond grabbed hold of a bush, leaned out over the holes, and said, “You can see the tibias.” I did as he did, and saw the bones. “Fourteen meters deep,” Edmond said. He told me that his brother-in-law had been a fanatically religious man, and on April 12, 1994, when he was stopped by interahamwe at a road-block down the street and forced to lead them back to his house, he had persuaded the killers to let him pray. Edmond’s brother-in-law had prayed for half an hour. Then he told the militiamen that he didn’t want his family dismembered, so they invited him to throw his children down the latrine wells alive, and he did. Then Edmond’s sister and his brother-in-law were thrown in on top. Never before in modern memory had a people who slaughtered another people, or in whose name the slaughter was carried out, been expected to live with the remainder of the people that was slaughtered, completely intermingled, in the same tiny communities, as one cohesive national society. That too seems unimaginable, even as it is also, in some sense, clearly necessary, and much of Gourevitch’s book addresses the moral chaos of this world in which “true justice” is impossible. Gourevitch ends on a cautiously optimistic note. “Power consists,” he says early on, “in the ability to make others inhabit your story of their reality”; later, he reiterates the importance of “how we imagine ourselves and of how others imagine us.” An effort of imagination, then — an effort to tell a different story, to insist on a different version of reality — is the best, or at least the only meaningful, resistance. We Wish to Inform You is full of failures to resist in this way, from those Rwandans who accepted the Hutu Power narratives of antagonistic identities and hatreds to the outsiders who envisioned “the Rwandan catastrophe … as a kind of natural disaster — Hutus and Tutsis simply doing what their natures dictated, and killing each other.” Gourevitch’s final story from Rwanda is not a happy one. At a boarding school in 1997, seventeen schoolgirls, faced with Hutu Power militants, refused to identify themselves or each other as Hutu or Tutsi and thus as enemies. It would be nice if their show of solidarity had won over the génocidaires, but in fact their refusal to discriminate caused them to be “beaten and shot indiscriminately.” Seventeen of them died. But in rejecting the militants’ reality, they stood up courageously for their own, and their world was one of friendship, not hate. Imagine that. Can you tell me what page that “still had to imagine it” line is from? I’d like to use the passage in my Holocaust Lit class. It’s on page 16, in the first chapter. An excellent post about a difficult book. Uneasy reading for today with what is going on in Ukraine and Uganda both.